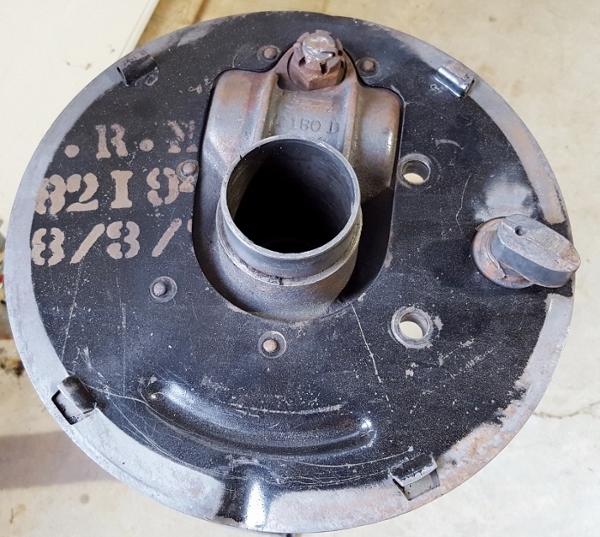 Model T Ford Forum: How Much Vertical Movement Should � Emergency Brake Shoes Have? How Much Vertical Movement Should � Emergency Brake Shoes Have? Model T Ford Forum: Forum 2018: How Much Vertical Movement Should � Emergency Brake Shoes Have? Hi George. We might as well get this into the archives in case there is a question on it in the future. I had the same problem on my 1926 coupe, in that one of the emergency brake shoe clips was worn off on both the right and left plates. Like you, I toyed with the choice of whether or not all four of the clips were needed, for being the lazy man I am, I didn't relish the thought of the work it took to replace them. Most choices like this can be approached from the standpoint that, one of Ford's biggest concerns was to shave off every possible second that it took each Model T to go down the assembly line so, with this in mind, he designed it for economy and minimization by designing in only the crucial components and removing any that weren't necessary and if he thought that the brake shoes could get by with just three clips, he would have designed it that way, since the addition of a fourth clip would add a couple of minutes to the time spent on the line. Minutes he was trying to eliminate, for each minute the car spent on the line, multiplied by the thousands of cars, employees and parts each day, amounted to thousands of dollars in labor and parts he had to pay. Therefore, I decided that it would be best to go ahead and repair it properly in case the fourth clip was crucial in providing the support necessary to ensure the brake shoes make uniform contact with the drums or that, in leaving the clip out would I risk the chance that, without the necessary support, the shoe might become cockeyed and not make the necessary contact to ensure that the emergency brakes provided the maximum stopping power they were designed to have. Since I had both drums and plates off, I found that all of the clips were badly worn and barely holding the shoes on, so I ordered eight new clips from Snyder's (if they are still available, as I did this in 2009) and using the cutoff wheel of a dremel tool, carefully cut off the heads of the original rivets. When the clips arrived, I riveted them on, using the right size steel pop-rivet making sure the rounded head was on the visible side so that I could dab the hole with some epoxy putty like JB Weld and formed to look like an original rivet. Dab on a dollop of black paint and it is hard to tell. Glad I could help, George. Stay safe. The lugs to hold the shoe in place varied over the Improved Car, the early backing plate carries riveted lugs. The next style has punched clear thu so there is a slight opening. The last design (3) has punched but a disc spot welded over the punched in place lug. My question exactly Dan. My backing plates are like your #2. On my RR, one of the punched out shoe guides is gone completely and another is damaged causing excess movement of the shoe. As stated above, I intend to order these clips tomorrow. Simply position them on the backing plate, drill 2 pop rivet holes ? Thanks for the picture. This hasn抰 been discussed before here. Yes to both. Had to do that to one backing plate I had, the formed lug was just gone, so made one from sheet stock, and riveted it with s.s. Pop Rivets. Used 2 rivets, side by side. My replacement was a bit wider than Ford version, but cupped the brake shoe edge just fine. You do have to have all 4 lugs in place around the circumference of the backing plate. With Lang's providing a replacement, I would use that now if I had to.